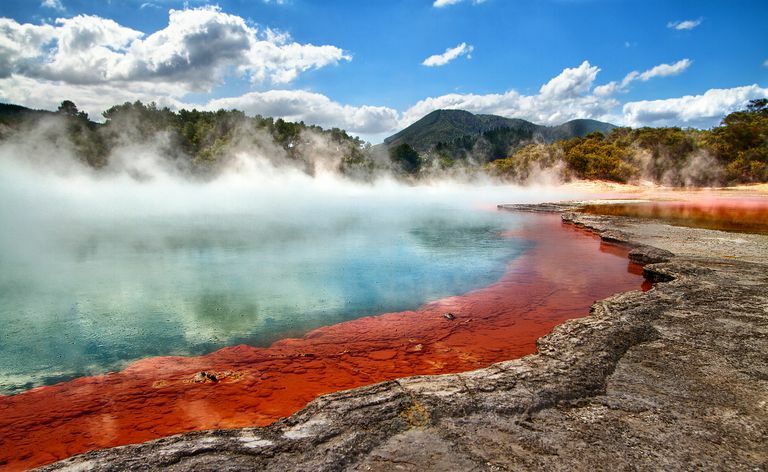 What Are Geothermal Pools or Hot Lakes? Geothermal pools can be found on every continent, including Antarctica. A geothermal pool, also known as a hot lake, occurs when groundwater is geothermally heated by the earth's crust. These unique and spectacular features are home to a plethora of species found nowhere else in the world. 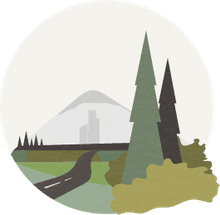 In addition, geothermal pools provide a cornucopia of ecosystem goods and services such as energy, a source of hot water, health benefits, thermostable enzymes, tourism sites, and even concert venues. The small island nation of Dominica houses the world's second largest geothermal pool, aptly named Boiling Lake. This hot lake is actually a flooded fumarole, an opening in the Earth's crust that often emits steam and noxious gases. Boiling Lake is accessible only by foot in an arduous four-mile one-way hike through the Valley of Desolation in Dominica's Morne Trois Pitons National Park. The Valley of Desolation is the graveyard of a formerly lush and verdant tropical rainforest. Due to an 1880 volcanic eruption, the ecosystem of the valley has changed dramatically and is now described by visitors as a lunar or Martian landscape. The fauna and flora found in the Valley of Desolation are limited to grasses, mosses, bromeliads, lizards, cockroaches, flies, and ants. The distribution of species is very meager, as to be expected in this extremely volcanic marginal environment. This lake is a gargantuan 280 feet by 250 feet (85m by 75m), and it measured to be approximately 30 to 50 feet (10 to 15m) deep. The lake's waters are described as grayish-blue and keep a relatively stable temperature range of 180 to 197°F (approximately 82 to 92°C) at the water's edge. The temperature in the center of the lake, where the water is most actively boiling, has never been measured due to safety concerns. Visitors are warned to be mindful of the slippery rocks and steep slope leading to the lake. The Blue Lagoon is another geothermal pool renowned for attracting visitors from all over the world. Located in southwestern Iceland, the Blue Lagoon geothermal spa is one of Iceland's top tourist destinations. This luxury spa is also occasionally used as a unique concert venue, for example for Iceland's famous weeklong music festival, Iceland Airwaves. The Blue Lagoon is fed from the water output of a nearby geothermal power plant. First, superheated water at a scorching 460°F (240°C) is drilled from approximately 220 yards (200 meters) beneath the Earth's surface, providing a source of sustainable energy and hot water to the citizens of Iceland. After exiting the power plant, the water is still too hot to touch so it is then is mixed with cold water to bring the temperature to a comfortable 99 to 102°F (37 to 39°C), just above body temperature. These milky blue waters are naturally rich in algae and minerals, such as silica and sulfur. Bathing in these inviting waters are said to have health benefits such as cleaning, exfoliating, and nourishing one's skin, and are particularly good for those afflicted with certain skin diseases. This visually stunning hot spring is the largest geothermal pool in the United States and the third largest in the world. Located in the Midway Geyser Basin of Yellowstone National Park, the Grand Prismatic Pool is over 120 feet deep and has a diameter of approximately 370 feet. In addition, this pool expels an immense volume of 560 gallons of mineral-rich water every minute. This grandiose name refers to the uncanny and magnificent bands of bright colors organized into an immense rainbow radiating from the center of this gargantuan pool. This jaw-dropping array is the product of microbial mats. Microbial mats are multilayer biofilms made up of billions of microorganisms, such as archaea and bacteria, and the slimy excretions and filaments that they produce to hold the biofilm together. Different species are different colors based on their photosynthetic properties. The center of the spring is too hot to support life and is therefore sterile and a beautiful shade of dark blue due to the depth and purity of the lake water. Microorganisms that are able to live in the extreme temperatures, such as those in the Grand Prismatic Pool, are a source of heat-tolerant enzymes used in an extremely important microbiological analysis technique called Polymerase Chain Reaction (PCR). PCR is used to make thousands to millions of copies of DNA. PCR has innumerable applications including disease diagnosis, genetic counseling, cloning research for both living and extinct animals, DNA identification of criminals, pharmaceutical research, and even paternity testing. PCR, thanks to organisms found in hot lakes, has truly changed the face of microbiology and the quality of life for humans in general. Geothermal pools are found throughout the world in the form of natural hot springs, flooded fumaroles, or artificially fed pools. These unique geologic features are often mineral-rich and house unique temperature resistant microbes. These hot lakes are extremely important for humans and provide a swath of ecosystem goods and services, such as tourist attractions, health benefits, sustainable energy, a source of hot water, and probably most importantly, a source of thermostable enzymes that enable the use of PCR as a microbiological analysis technique. Geothermal pools are a natural wonder that has affected the lives of humans around the world, regardless of whether one has personally visited a geothermal pool or not.